The current best estimates for the parameters of various test articles run by public research institutions (NASA Eagleworks), universities (California State Univ., Physics Dept., Fullerton, USA; TU Dresden, Aerospace Department, Germany, Northwestern Polytechnical University, College of Aeronautics, Xi'an, China), very small private companies (SPR Ltd., Cannae LLC. ), and independent engineers/researchers, is here, along with the reported forces. Note that complete dimensions are not known in most cases, and some had to be determined via indirect methods (e.g., for Shawyer's Exp. and Demo, from the big diameter and the Design Factor, scaling from photographs, from Yang's frequency vs. dimension figures, etc.). See Building for details on drives built by do-it-yourselfers. Credit to Dr. Rodal and others for the great effort in compiling these. Please note some caveats for this data, at that link. ↑ Mode shapes for the EM Drive truncated cone geometry are given according to the closest mode shape for a cylindrical geometry, instead of given by the eigenparameters of the truncated cone eigensolution (for example, using the wavenumber). The reason for this is two fold: 1) There is no standard convention on how to number mode shapes for a truncated cone, and 2) the truncated cone geometry used by the EM Drive researchers has been close to a cylinder: the cone angles have been relatively small. Therefore the mode shapes resemble those of a cylinder. TM means "transverse magnetic": a mode shape where the magnetic field is in the azimuthal, solenoidal direction and the electric field is in the transverse and longitudinal direction. TE stands for "transverse electric": a mode shape where the electric field is in the azimuthal, solenoidal direction and the magnetic field is in the transverse and longitudinal direction. The subscripts m,n,p in TMmnp and TEmnp, stand for the mode shape quantum numbers in the azimuthal (m), transverse (n) and longitudinal (p) directions respectively. ↑ This field denotes whether the test was performed in ambient conditions (hence the field labeled as "Ambient") or in a partial vacuum. When the researcher has provided the pressure in the partial vacuum condition, this is given in the units of Torrs. The bases of the truncated cone used in the experiments are flat, so in the spherical geometry the flat base is described by the secant to the circular arcs joining the intersections between the circular arcs and the lateral walls of the cone. ↑ Shawyer's Design Factor, when not provided independently (for example by Shawyer in his pubblications) was calculated for cavities without dielectric inserts with TM010 as the cutoff frequency for TM01p modes, with TE010 for TE01p modes and TM210 for TM21p modes. For cavities with a dielectric insert it is not calculated. ↑ Quality factor of resonance: a dimensionless measure inverse to damping: the higher the Q, the lower the damping. Infinite Q corresponds to zero damping. Critical damping occurs for a value of Q = 1/2. ↑ Nearest possible mode shape according to NASA's COMSOL analysis. Also, @TheTraveller reported that Shawyer recommended a TE01p mode for the Flight Thruster. (Where p=3 for the Flight Thruster because it is excited at a higher frequency). Also Prof. Yang reports using TE01p modes, and @TheTraveller reports that Shawyer was an initial advisor. ↑ See these posts by TheTraveller on dimensions of the Flight Thruster and  and . ↑ The Brady et.al. report reads: <<We performed some very early evaluations without the dielectric resonator (TE012 mode at 2168 MHz, with power levels up to ~30 watts) and measured no significant net thrust.>>. The test was performed at the very earliest in Brady et.al. 's testing program. The test was performed without a magnetron, only using the 25W Mini-Circuit Amp, since at the time of this particular test, NASA Eagleworks did not have the PLL circuit running for this data run. Brady et.al. do not provide the Q quality factor of resonance for this test. @TheTraveller made an argument that the test may have been conducted at the wrong (too low) frequency for resonance  . ↑ 20.0 20.1 20.2 Q calculated from Fig.5 "frustum microwave cavity actual resonance curve"of "Net thrust measurement of propellantless microwave thrusters", 2011, where Frequency Bandwidth=0.0016GHz, Frequency=2.45 GHz, hence Q=2.45/0.0016=1531. This is the value of Q calculated according to the convention in the West. See definition of quality factor Q . Notice that Prof. Yang reports different values in her tables because of her different convention. 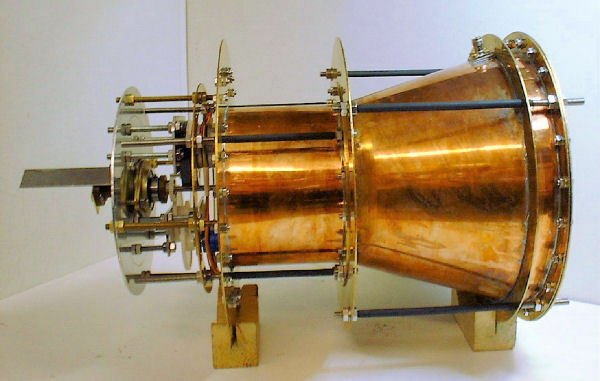 ↑ See http://www.masinaelectrica.com/emdrive-independent-test/. Because of the high profile nature of the tests, they are included here merely to give a rough comparison to the more scientifically rigorous tests. The measured thrust in this table is an average of multiple runs in tests 3 and 3.1, subtracting out the likely effects of hot air. @deltaMass calculated the net thrust for the EmDrive across both test. See . ↑ Forum post by @Rodal - Included here because Prof. Woodward's device is also a propellant-less concept, and because Paul March (NASA) maintains that Prof. Woodward's Mach Effect theory might also be, in his opinion, an explanation for thrust for the EM Drive. ↑ 26.0 26.1 Samsonov, Eugene (2016), "Null Result for Prediction of Asymmetrical Anomalous Force from Frustum-shaped RF Resonant Cavity"
↑ Frustum dimensions violated Shawyer cut-off criteria at the small end. ↑ No known violations of Shawyer theory in this test. This page was last edited on 29 September 2017, at 13:25.